In a previous post, I described some strategies for brainstorming. While none of these are technology dependent, Yutongo offers a tool for social brainstorming. In step 1, you are invited to create an idea challenge. Create a title and description for your challenge as shown in the video below. Brainstorming in Yutongo is about taking part in a structured ideation process. This means that you don’t ask a single open-ended question or set forth a broad idea challenge to get people started. Instead, the person creating the idea challenge takes the initial challenge topic and asks many questions that relate to different aspects of the topic. You’re encouraged to add inspiration questions (questions to encourage divergent thinking) and compression questions (questions that can encourage convergent thinking as well). When users get to compression questions, they’ll be able to see some of the idea fragments generated by the inspiration questions sets and can use these fragments to come up with more specific ideas for answering a question. This video provides an overview of the basic process. The questions I came up with for my challenge are below. How would you define an “effective” health literacy game? What game mechanics should be included in a health literacy game? 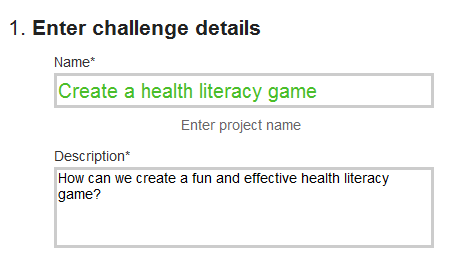 Make up a new type of game mechanic for a health literacy game. What makes a game fun generally? What would make a health literacy game fun? If you couldn’t use points or badges, what rewards would you provide in a health literacy game? If your health literacy game was a story, what would the plot be? If your health literacy game was a story, what characters would be included? Give your health literacy game story a title. What technologies can we use to create a health literacy game? If you couldn’t use technology, how would you create a health literacy game? How can we make a health literacy game social? How can we encourage participation in game behaviors outside of the game? How do we protect privacy in a health literacy game? Here you’ll characterize your questions as idea boosters or compression questions as shown in the video below. One thing that’s a bit tricky about this step is that you’ll need to include introductions to your challenge, idea boosters, and compression question sections to let the tool know to include context screens. When you include these introductions, you leave the fields blank as illustrated below. When you’ve completed the process, you get a link that allows you to run through your challenge. Here’s the link to the challenge I created. 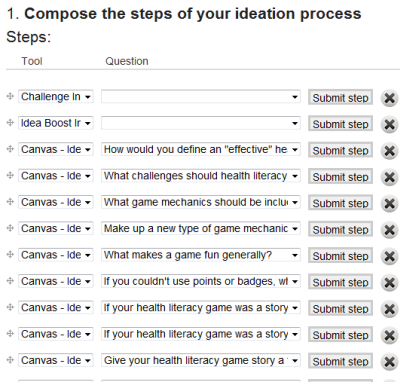 You can go back and edit the questions you’ve created and your ideation steps. In my hands, the latter process was a bit buggy. While I could drag and drop the questions, I had difficulty getting my final challenge to update. The tool’s still in beta so expect some glitches. Yutongo is an interesting way to provide some focus to brainstorming. You can use the tool to facilitate both divergent and convergent aspects of the process. This is illustrated below as the collection of idea fragments (encouraging mainly divergent thinking) and the combination of idea fragments (encouraging both divergent and convergent thinking). As someone using the tool for the first time, I found it an instructive process to actually think about questions I should ask. My goal was to make some of the questions a bit provocative. I probably asked too many questions, but I’ll get a better sense of that as people participate in this challenge (so start participating!). From a participant/learner standpoint, the brainstorming experience is dependent on the questions being asked and which questions are identified as idea boosters versus compression questions. Yutongo provides a way to experimenting with creative processes. It offers a learning process for both instructional designers and learners! You can learn more about Yutongo here and here.